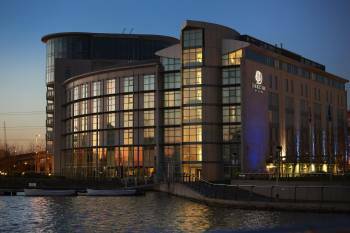 Situated on the waterfront, DoubleTree By Hilton London Excel is just 0.5 miles from London City Airport. The O2 Arena and Canary Wharf are just a 10-minute train ride away. Closer by, the ExCel Exhibition Centre is next door to the hotel. This 4-star hotel offers bright rooms each with free WiFi access, a 40-inch LED TV and a private shower room with complimentary toiletries. Some of the spacious suites feature balconies, with views across the waterfront. This DoubleTree By Hilton London Excel has a Fitness Room with cardio equipment, free for all guests. For our dining options, you can come to our bar lounge ‘Bidder & Co’, which offers modern casual dining, seasonal plates and delicious cocktails. Our contemporary restaurant, The Salt Port Restaurant & Deli, is on the banks of the Royal Victoria Dock and offers panoramic views. It is perfect for a network launch, drinks receptions, and informal gatherings. Whether you invite friends, colleagues, or clients to an event at DoubleTree by Hilton Hotel London ExCel, we’ll make sure that everything will run smoothly. We’re ready to help: setting up your space, supplying the room with what you need, or meeting special dietary needs, we’ll make sure the details are dialed in. We’d love to give you a tour and show you some of the ways we’ll help you make your next event the best ever. Check on availability with us today.